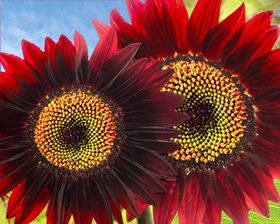 The deepest red sunflower! Wine- red velvet petals are flecked with gold. Flowers are 15-20 cm across on 150-200 cm plants. Multiple branched and purple-stemmed, it's dramatic in the garden. Pollenless, so it's good for cutting, too.